We’ve been travelling to the Marais Poitevin, a.k.a. La Venise Verte, a few kilometres inland from La Rochelle, for many years. We used to stay at a very pleasant campsite in Damvix; we even became recognised by and struck up a sort of friendship with the campsite owner, Didier. [Ed: what a comfortable sounding name Didier is – were I French, I’d quite like to be a Didier. Or Jean-Paul. Or maybe Etienne. Anyway …] Didier even bought us a drink once when we stumbled across La Fête de la Musique on one visit. Charming! All good things come to an end and Didier retired, surrendering the campsite to new ownership. However, a mere 2 mls/3.5 kms down the road is Arçais where our friends Mike and Linda live. It’s great to visit them and share a little vino, paella, Thai food and so on. Arçais also has a campsite; it’s a little more rough and ready than the one at Damvix but pleasant enough, nonetheless. It’s also has the distinct advantage of being with crawling distance of Mike and Linda. For the last couple of years, we’ve made this our base in the Marais Poitevin. Another advantage is that our favourite pitch is surrounded by a very productive, when it’s flowering, privet hedge. Fortunately it flowers in late May which is when we are most likely to be there. The trick is to get there before M. le gardien gets out his hedge trimmer and massacres all the highly aromatic privet flowers. Then it is like a very powerful magnetic to a mass of passing wildlife and it is at its most productive, for a nature watcher. In 2010, I saw my first Large Copper butterfly feasting on the privet flowers, and very thrilling it was, too. 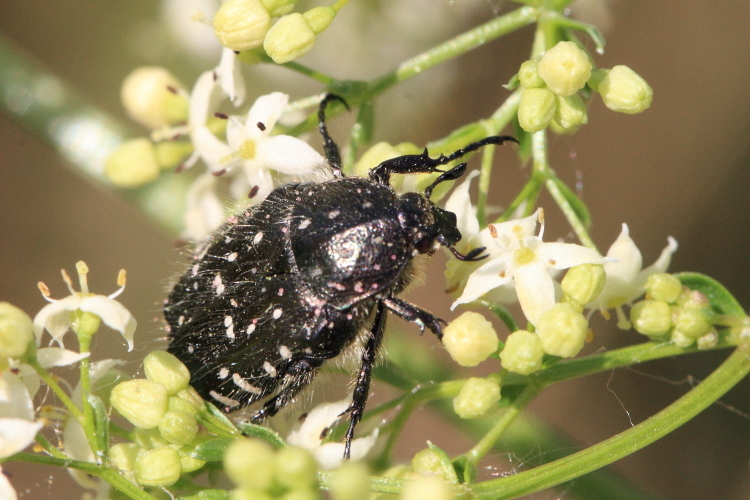 2011 seemed to be the year of the beetle. 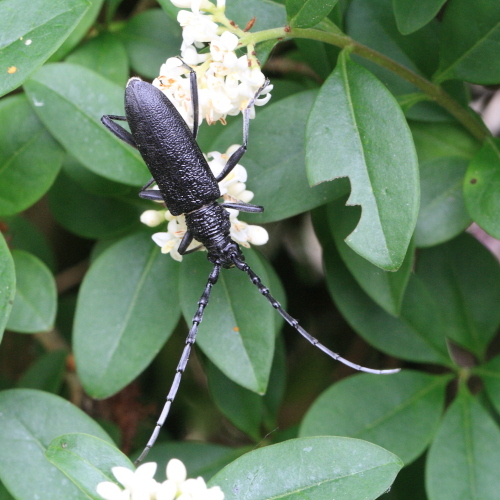 Many, though not all, were found in our favourite privet hedge. M. le gardien was champing at the bit to cut the hedge back but we got there in time. 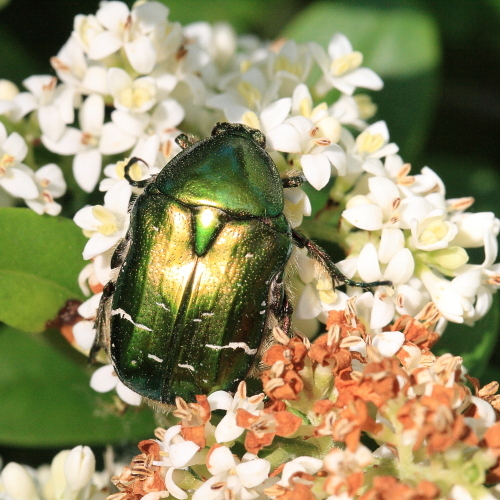 Leading the band on stage in a rather flashy metallic green suit was Rose Chafer (Cetonia aurata). Catch that in a super-trooper spotlight and the audience could well be dazzled – we certainly were. You can spot the leaders a mile off, can’t you? On supporting vocals and giving a little bass gravitas to the whole proceedings, was Oxythyrea funesta. I’m afraid the audience is just going to have to learn to deal with the scientific binomial name which could be shortened to O. funesta, there being no common English term that we’ve found so far. 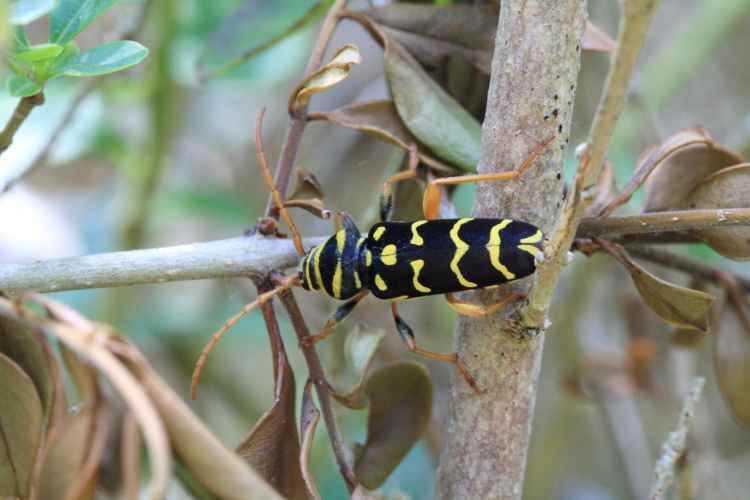 The flashy git on lead guitar just has to have been the strikingly-marked Plagionotus arcuatus. No hiding backstage out of the spotlight for him, with his bright yellow striped suit. Another one with no readily pronounceable English name, either, so just go ahead and scream, girls. 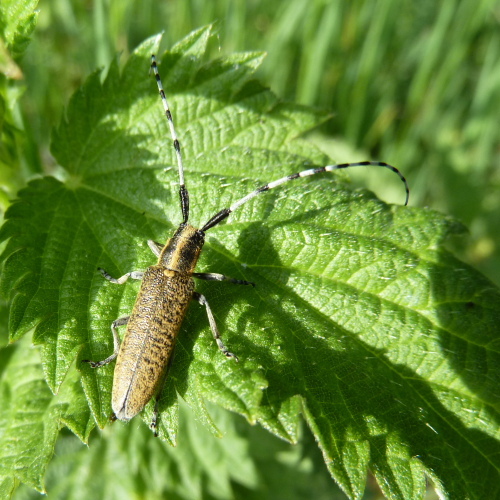 The beetle intended to be the original drummer was to have been the rather subdued Agapanthia villosoviridescens (far left). However, a bunch of screaming females was never going to get their collective tongues around a name that complicated – heck, I can’t pronounce it either before or after a drink. So, I’m afraid poor old A. villosoviridescens was seen as something of a hindrance to stardom and a new drummer was hired with the much more approachable handle of Capricorn Beetle (Cerambyx scopolii, in formal circles – near left). Good set of drum sticks! Of course, no tour can be staged without a considerable amount of support in the background. These guys in the fancy striped suits weren’t actually in the back ground, but they were on the grounds of Linda’s allotment, a.k.a. the farm. In England, these would start alarm bells ringing and be a cause for great concern. Pretty though they may be, they are a pair of incredibly destructive Colorado Beetles (Leptinotarsa decemlineata) – and they appear to be mating. Yikes!